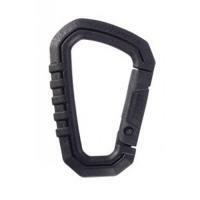 These small 2.5" carabiners from ASP are a convenient, cheap and accessible way to carry extra gear. Simple to clip and unclip, their tough polymer construction gives them plenty of load-bearing strength for carrying small items, and they fit easily on to a webbing system or belt. Each pack contains one carabiner, and there are six colors to choose from: black, grey and coyote for on-duty wear, as well as three different neon options for easier visibility.